Hey, Happy New Year out there. The day I get to discover whether the blog software survives a transition to a new year! Let me know if you don't see this, OK? Yes, I'll take that! Avoid spirit-crushers! Good advice! ■ You think you're cold? Let Janice Brown take you back a bit in time to The Way Things Used To Be in New Hampshire: 100 Years Ago: WWI and the New Year. To complicate things there was a drastic coal shortage, and so the poor of all cities fled to the police and fire stations, and churches seeking warmth. There were a series of fires and explosions as people tried to thaw out their pipes with burning rags, or the water pipes common in kitchen stoves of the day exploded. Frost bite was a common case seen in the hospitals. Nearby military training camp, Camp Devens in Massachusetts, was not immune from the frigid weather. The news reported that the thermometer in front of the Quartermaster Depot registered 34 below zero. There was a great need for more knitted articles for the soldiers, especially helmets and wristers. Work animals suffered too. Police in many places were on the lookout to insure that horses were blanketed. Brr. Read it and be thankful to live in 2018. $100 says that less than 300 people will die of Ebola within the fifty United States by January 1, 2018. As always, you can insist I got lucky. But this would carry far more weight if pessimists were lining up to take my money back in 2014. Needless to say, they weren't. Betting kills hyperbole; and for most people, politics without hyperbole is as dull as watching paint dry. Any chance we'll overdose on dullness in 2018? I'll bet not. Every once in a while with Twitter, you find something that breaks through the bilge and recrimination. Or, sometimes something finds you. One night, “The Mechanics of History” found me. It’s an art installation by Yoann Bourgeois that sat in a daylit rotunda at the Panthéon, in Paris. And for a long while in late fall, I found myself mesmerized by a video of it, starring men spinning off a staircase and onto a trampoline. It’s beautifully ordinary. 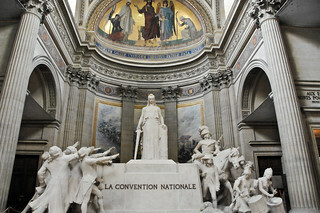 And occasionally that ordinariness achieves magnificence, like the moment when the camera’s framing captures the succession of staircase-d men so that it rhymes with the electric succession of French Republicans flinging their arms up at the pedestaled “live free or die” ” lady in François-Léon Sicard’s “La Convention Nationale” sculpture, which dominates that section of the building. Video had captured one incarnation of the sublime fleetingly in sync with another; a work about the slipperiness of forever meets a work of actual physical permanence in a way that felt a lot like filmmaking. Confession of a Philistine: I was unaware of the "live free or die" lady. The sculpture (a Flickr embed is our pic du jour) commemmorates the post-revolution National Convention, which oversaw the delightful Reign of Terror. The big lady is "Marianne", the symbol of the French Revolution, and she overlooks the inscription: Vivre Libre ou Mourir, which I bet you can translate on your own. ■ We also got an LFOD alert from a Union Leader article: Bitcoin believers explain why they've bought in. Among the "belivers" are Derrick Freeman and Steven Zeiler, proprietors of the "Free State Bitcoin Shoppe" in Portsmouth (which I still haven't visited). Over the summer, Freeman and Zeiler noticed a vacant storefront in Portsmouth and decided to open a retail space where they only accept cryptocurrency. According to their website, they aim to "Help people use better money. Inside the Shoppe, you'll find unique crypto-themed gifts, seditious books, libertarian art, pro-science T-shirts, and "Live Free or Die" propaganda - all available for Bitcoin, Ethereum, Dash, and most other cryptocurrencies. We love to talk tech and are here to answer your crypto questions." "Propaganda", hmph! What happened to you, Union Leader? It's like I don't even know you any more. The Free State Bitcoin Shoppe website is here, so checkitout.